Undeniably, it is a thing of beauty; but it is so much more. It was produced by Irish monks around 800 C.E., probably on the island of Iona. It contains the texts of the four Gospels – Matthew, Mark, Luke and John – transcribed following mainly the Vulgate Latin text, and written in a beautiful style of calligraphy that became known as “the Irish Hand”. Today the 340 extant vellum leaves (folios) – we are missing about 30 – are on permanent display in the Trinity College Library, Dublin. The very first folio in the extant manuscript comprises the final section of an etymological guide to Biblical proper names, chiefly Hebrew names, which was compiled by St Jerome in the fourth century. Then, before we get to the Gospel texts, we go through canon tables – concordances of gospel passages compiled in the fourth century by Eusebius of Caesarea – then the Breves Causae – lists of chapter contents – and finally the Argumenta, which are like gospel prefaces. All this tells us that the creators of this manuscript were well educated, literate in Latin and at least somewhat in Hebrew, and in touch with learning in the rest of the Christian world. 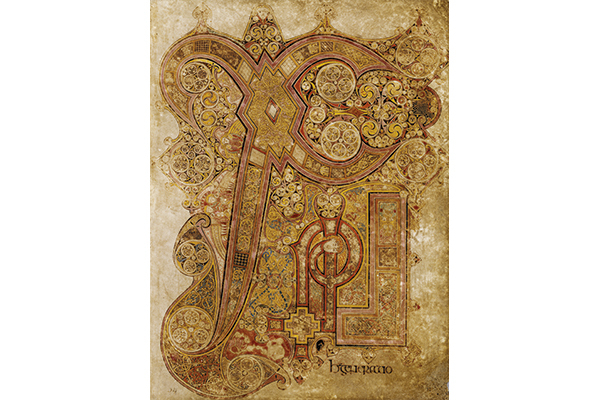 The Book of Kells might well be described as a song of joy at the incarnation, a celebration of the good news of the birth of Christ. While the cross and crucifixion is never sidelined, the strong proclamation is of joy at the Christ event, and indeed at all of creation. Creation is for eternal life with God. This is beautifully and intricately explained to us on folio 34r. The text on this page is Matthew 1:18 – “Now the birth of Jesus the Messiah took place in this way”: in Latin, “Christi autem generatio”. It is not easy to find these words, indeed, it is difficult for us, with our modern sensibilities, to know what this page is about. Simply to gaze on it, to see the detailed work, is mesmerising. But to decipher, to actually “read” the page, is just astounding. It takes time to penetrate the deep mystery that is being “preached” to us: the good news, evangelion, that Christ has come into this world. At the bottom right of the page we can read some letters: hgeneratio. The “h” was often used in insular art as short-hand for autem; the generatio is clear in the script. The name of Jesus now needs to be found. There is no sign of it. Instead we find a monogram of Christ, that is a “Christogram”. In the early days of Christianity, Christians were often persecuted. In response, so that they could recognise each other, secret codes and symbols were developed. A well-known symbol was the combined Chi Rho. Chi and Rho are the first two letters (XP) of the Greek word Christ, ΧΡΙΣΤΟΣ (Christos). 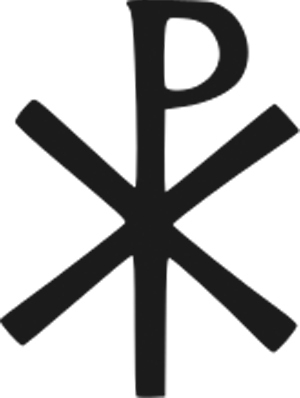 Wherever early Christians saw the Chi (x) Rho (p) symbol, they read “Christ”. Chi Rho was often used to mark Christian gravestones, and a supreme example is found on folio 34r. This folio is often termed the “Chi Rho page”. The Chi (X) is richly decorative, overwhelming the page, like a huge, uneven sided X. The Rho (P), at the bottom right, begins with a bright yellow stepped cross and ends with the clean-shaven head of a man – most likely that of Christ. Then we also have an iota (i) – ΧΡΙ (Christos). Thus we can read Christi autem generatio – ΧΡΙ hgeneratio. “Reading” deeper still we can see that at the focal point of the X is a diamond shape – a lozenge within a lozenge, surrounded by lozenges. This is a distinctive element in the theological vocabulary of Kells. This four-sided geometric shape reflects the harmony of the fourfold ordered cosmos: with its four cardinal directions, four seasons, and four elements of earth, air, fire and water; and, in the human realm, the four humours and the four cardinal virtues. This diamond shape is also a Christogram, a sign for Christ, who, as Matthew tells us, will draw humanity and the entire cosmos back to order and beauty. The Irish Church was familiar with this Christogram: on the south face of the magnificent High Cross at Moone Abbey there is a lozenge shape where we would expect to find the crucified Lord. To the right of the lozenge in folio 34r are the creatures of the air, moths with a chrysalis, and, at the bottom of the page, on either side of the Rho, cats with mice, suggesting earth, and an otter with a fish, suggesting water. These creatures, almost hidden in the decoration, speak of Christ becoming incarnate for the salvation of the whole of creation. Going deeper again, there is a deep Eucharistic symbolism. Look closely and you can see what seems like a Eucharistic host between the two mice – it is the Eucharist that brings peace between mouse and cat. And we have an otter with a fish, another symbol of Christ from the second century. Just as wherever Christians saw the combined Chi Rho they read “Christ”, so too, when they see the symbol of a fish, they read “Christ”. The Greek word for fish is ichthus: interpreted as Iesous Christos Theou Uios Sotor – Jesus Christ, Son of God, Saviour. Perhaps the most profound of the Eucharistic symbols lies with the moths, and the chrysalis between them. They seem to be eating it: from the chrysalis new life comes, from death comes life, from Eucharist, eternal life. In just one page of this astonishing book there is an explosion of theological insight. To both scribe composing, and to the readers over the generations, the message is clear. Christ has come into the world, now all is different. Incarnation, resurrection, salvation, eternal life, are promised to those who embrace this message. Fáinche Ryan is the director of the Loyola Institute, Trinity College Dublin.